Last night, as I stashed all of the new goodies from my farm share into the refrigerator, I was happy to see that we had received both baby arugula and some mesclun mix for salads this week. Today, as I made my lunch, I was even more delighted (I may have actually cried out in glee) to discover that what I thought were salad greens were actually fiddleheads! Somehow, I have never had the opportunity to sample these harbingers of spring, so I am very excited to experiment with another farm share first. My husband seems fairly certain that they are best enjoyed via a quick pan sautee and a dash of salt and pepper. However, the little wrinkle of doubt in his brow as he says so leads me to believe that some research is in order. So, this afternoon I will be forgetting about the cold and rain outside and happily perusing the internet and my cookbooks for a recipe for tomorrow evening. 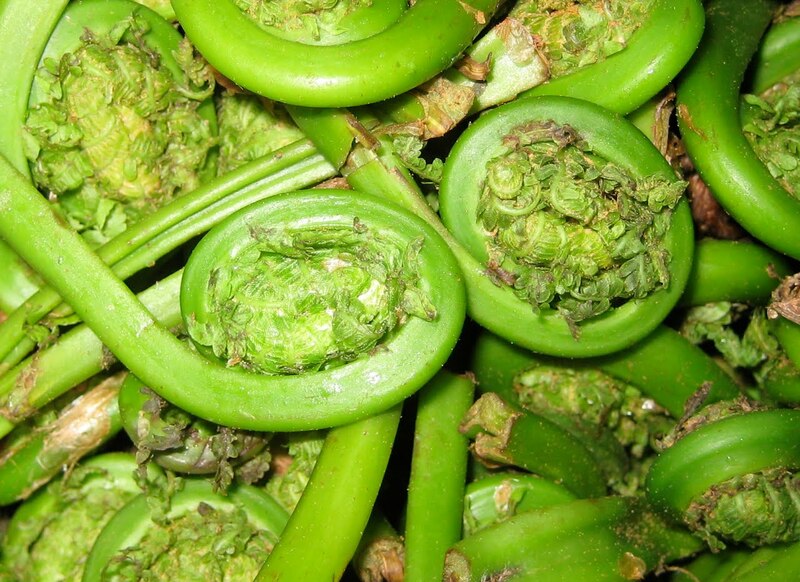 In the meantime, suggestions from fiddlehead connoisseurs are welcome! Happy, happy spring! Tales From the Freezer...and a Recipe or Two. Last fall I made my first tiny attempts at food preservation. Being a renter with a rather quirky kitchen, my options were limited, but I wanted to make a go of it nonetheless. After all, if I'm ever going to go for a full scale canning, pickling, and drying operation I had to start somewhere, right? Given the superoverabundance of farm share peppers and back yard basil that I found myself struggling with at the end of the summer months, I decided to give both treats a go round in the freezer. I vaguely recalled hearing that peppers could simply be chopped and thrown into a freezer safe container, and a little online research revealed that basil could be frozen in a variety of ways (to mixed reviews)--I opted to test out freezing chopped basil in both water and olive oil. Result? A mixed bag. I'll start with the bad news. The basil, sadly, did not fare well in either form. I froze them in cubes in the ice tray, and when thawed...it looked more like fragments of ash than the delightful taste of summer that I'd hoped to preserve. Still worse, flavor seemed to have disappeared altogether. In short, this was a double fail. In hindsight, I suspect I may have tried to pack far too much basil into each tiny cube. Consequently, much of the leaves were exposed to the harsh freezer air rather than protected by a solid fortress of water or oil. In the end, I did find some success in freezing small batches of pesto I had made. It thawed out looking as green and fresh as the day it was born, and with a little dash of salt all of those fabulous summer flavors came right back to life. For the simple and easy recipe, click here. Happily, the frozen peppers were a marvelous success. Not only were they much easier to prep for freezing than the basil--just wash, dry, and cut into whatever size and shape you desire--but they lasted through the whole winter without getting dry or freezer burnt. 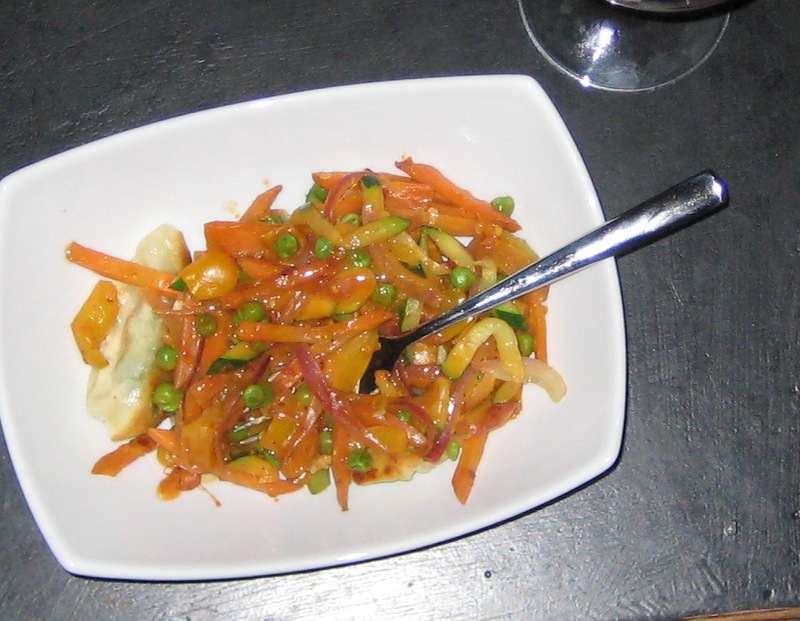 For the most part, I used them in my favorite new recipe, a veggie stir fry with peanut sauce. Thanks to my winter farm share with Enterprise Farm, I was able to combine my summer peppers with organic carrots, zucchini and other yummy produce from their East Coast Food Shed. All in all, I'm happy to have discovered two reliable freezer methods for preserving the abundance of summer. As for the basil, if any of you lovely readers have had better luck with these methods or something altogether different, I would love to hear about it! In the meantime, enjoy this peanuty stir fry recipe, which can be made with just about any veggie you love, fresh or frozen. In a bowl or a large measuring cup, combine the peanut butter and water. Whisk until thoroughly blended, adding a touch more water if it's still very thick. Add 1 tablespoon of soy sauce along with the rice vinegar, sesame oil, and chili paste. If you don't have fresh ginger to cook with the veggies, add a few good dashes of powdered ginger here. Give a good stir and a taste. This sauce seems to work a little differently each time, so once you've got the base recipe feel free to add up to another tablespoon of soy sauce or a dash of any of the other ingredients in order to bring it into balance. Julienne the carrots, zucchini, peppers, and onion (i.e. cut them into thin strips, matchstick-sized strips), chop the broccoli into small florets, and dice the garlic and ginger. Sautee the vegetables in olive oil, starting with those that take the longest to cook. For this particular combo, it's best to start with the broccoli, add the carrots, then add the zucchini, peppers, and onions. Save the peas for the very end so that they keep their lovely green color. Just before you add the peas, make a well in the center of the pan and add the garlic and ginger. Sautee for a minute or two and then stir them into the rest of the vegetables along with the peas. Add your peanut sauce and serve over brown rice or pot stickers. Simple, quick, and tasty!